Lee Gale is a Photographer from Hull, East Yorkshire, UK with a keen interest in Long Exposure, Landscape, Urban Exploration and Light Painting Photography. Lee has always been a lover of the great outdoors and photography has gone hand in hand with that passion over the last few years. 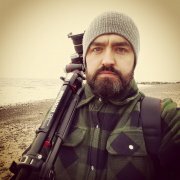 Lee has recently taken part in some local photography exhibitions and one of his goals is to put on a solo exhibition of his own work and hopes to one day produce a book of his work.